Base Of Operations: Philadelphia, PA. Height: 6’1” Weight: 252 lbs. When he was Doink the Clown, Borne possessed the power to create duplicates of himself. The first four were always identical to Borne in appearance (but with different colored costumes and wigs), but were slightly slower and weaker than Borne, himself. The next four duplicates were dwarf-sized versions of the first four. Doink had a seemingly never-ending supply of clown-based weapons and equipment, which he shared with his duplicate selves. After his torture and dismissal by Dr. Bingo, Borne lost these abilities. He also lost access to his “Bag of Goodies” which were apparently supplied by his boss. The experience did leave him with the ability to resist mind control and to cloud his mind, preventing telepaths from probing his thoughts. That’s ok; no one really wants to read his thoughts much anyway. Matt Borne was a cut above your average criminal henchman. He was smart, resourceful, and tough as hell in a fight. He had done some serious jail time without ever pointing fingers at his employer at the time. He was well respected for that in the East Coast underworld. He even did the nasty jobs that no one else wanted to do (without brown nosing) and people took notice. He only made one career mistake; he agreed to work for the Dr. Bingo. Dr. Bingo was not your “typical evil clown” that populate film and comics. He was a seasoned veteran of numerous wars. He had worked as soldier, thief, and assassin not just around the world, but in different dimensions as well. He didn’t use gimmicked clown toys as weapons, or giggle maniacally, or have funny green hair. Borne had some reservations, but the money was fantastic, and Bingo promised him considerable superhuman powers. If it meant painting his face white for a while, so be it. Bingo supplied the outfit, as well as the “bag of goodies”, a seemingly never-ending supply of clown-themed weaponry. He also subjected Borne to a mysterious energy device that imbued Borne with the ability to split himself into eight bodies. Four were of normal size and four that were approximately 3’6” tall each. Then Bingo introduced “Doink” to his teammates – Gore, Amityville, and Brother Peter. Working with a man capable of using his own blood as multi-purpose weapon, a man with the ability to animate objects using his own life force, and a skilled voodoo practitioner, Borne quickly realized that he was out of his league. In addition, he found that the nature of the missions (often interdimensional and ALWAYS bizarre) were beginning to psychologically affect him. After several successful missions with Freakshow, he informed Bingo that he wasn’t cut out for the costumed stuff after all. Dr. Bingo wasn’t happy with the decision. Especially when he found that Borne was walking with some of the “Bag of Goodies” equipment, much of which was on loan from “a powerful client.” Bingo felt it was best to make an example of Borne. Borne went through over three weeks of constant torture. It was performed both by Bingo and by Brother Peter, using a voodoo fetish to inflict pain. Borne’s mind snapped. When he was released from his restraints on the 22nd day of torture, he struggled free, broke Brother Peter’s neck, and escaped. He has spent the last year alternately running from, and chasing after, Dr. Bingo in a barely-lucid quest for revenge. He calls himself “Borne Again”. This is in reference to his shedding of the Doink character, and his mostly-unsuccessful attempt to reclaim his real identity. Borne again is a formerly muscular man in his mid-40s. He has let his physical conditioning go, resulting in a good bit of extra weight around his middle. He has stringy, thinning, light brown hair. He wears either A) full clown makeup on the upper right side of his face or B) partial clown makeup around both eyes. He is normally seen in a spandex outfit with “clown costume” designs on it (the clown equivalent of a tuxedo T-shirt). Occasionally, he wears a white latex clown headpiece with green, frizzy hair. As Doink, Borne was sane. But he acted like a typical circus clown, playing pranks on those around him (generally physically or emotionally damaging pranks). During this time, Borne’s out-of-costume personality was that of a smart, resourceful, underworld thug. Following his torture at the hands of the Dr. Bingo, Borne went off the deep end. He has frequent flashbacks to his period as Doink. Even when relatively lucid, he rants about the humiliation of wearing a clown suit and makeup for money, failing to realize that he’s still wearing the suit. I was planning on using the Joker instead of my own character, Dr. Bingo. But I didn’t want to anchor my wrestling write-ups in the mainstream DC Universe quite that much. That said, the whole story was written with the Joker in mind as a suitable substitute for Bingo. Or you can keep Dr. Bingo as the clown employer and do what I did – have the “powerful client” be the inter-dimensional pawnbroker, Barter. Barter trades with Bingo – freaky weaponry in exchange for Bingo’s occasional services. The last time I used this plot hook in a campaign, the PCs in my old game strong-armed Barter and he sent Dr. Bingo after them in retaliation. 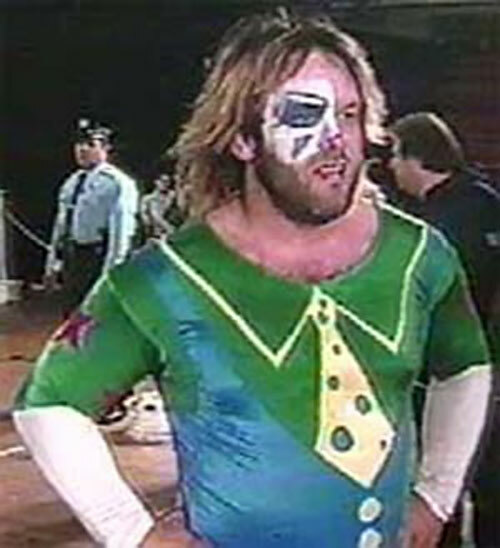 Catastrophic Psychological Instability, Traumatic Flashbacks (his time as “Doink the Clown”). The first 3 APs Split allows him to split into a total of 4 full-sized duplicates (original + 3 duplicates). The next four allow him to create 4 dwarf clown duplicates (“Dink”), using the Shrinking power. Shrinking only works to make duplicates 5-8 dwarves. The original Doink always maintains his original attributes. #2-4 have normal attributes and skills at minus 1 AP. #5-8 have normal attributes and skills minus another 1 AP. 8 AP ABC Omni-Gadget (x16) (these gadgets take the form of clown toys. When using his Split power, the Omni-Gadgets are divided equally among the duplicates). Source of Character: WWF (for Doink) and ECW Wrestling (for “Borne Again”), along with my own stuff. Helper(s) and other sources: Dr. Bingo, Amityville, and Brother Peter created by Andrew Lee ; Gore created by Jason Reeps and Dale Glaser.